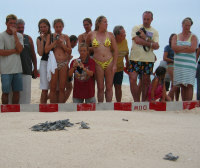 The Caribbean region has demonstrated – although not yet as extensively as might be possible – that turtle-watching can significantly contribute to the conservation of sea turtles and their habitats, increase awareness and appreciation for conservation, provide opportunities for local communities to secure additional employment, learn new skills, engage in and support conservation and tourism activities, and derive both social and economic benefits from their involvement in these operations. 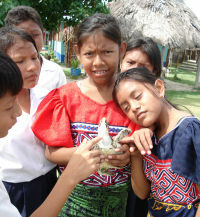 Further, such a venture can be empowering culturally, politically, and economically for individuals and communities. 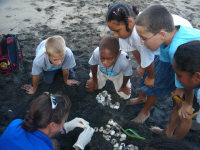 Recognizing that many sea turtle nesting sites remain in rural areas adjacent to communities that may have few economic options and little awareness of or ability to address sea turtle’s conservation needs, the ideal sea turtle-watching venture would focus on reversing negative impacts and enhancing conservation over both the short and long term, by generating a wide range of benefits that include those to local communities. To achieve this level of success, the following considerations, more thoroughly discussed in a Caribbean Handbook to be published later this year, should be taken into account. The Importance of Scale. 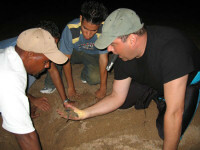 One very important consideration early on in designing a turtle-watching operation is the question of scale. How locally or widely should any negative impacts be anticipated to occur, considered relevant to the operation, and be measured? How locally or widely should benefits be expected to accrue? 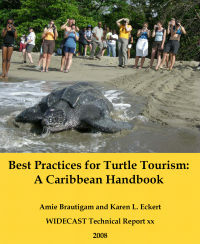 Should these impacts or benefits be limited to turtles and turtle habitats, or should they also include socio-cultural and economic impacts, such as on local populations that may interact with tourists? The nature of the operation, and the types of structures and systems that will need to be designed and implemented, will directly relate to the scale that is determined appropriate for the operation. Community Capacity. Consideration must be given to whether a community has the capacity to invest in and sustain the necessary institutional development, operational management, marketing programs, facilities maintenance, and other aspects of a successful tourism venture which can include everything from law enforcement to service quality issues. An analysis should be conducted to define strengths and weaknesses, as well as opportunities and threats, and then an action plan designed to guide program implementation. Well defined and supported partnerships with Government (at community and national levels), the private sector, and relevant experts are essential. Standards and Performance. 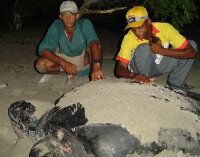 There are four essential levels of activity in operating an effective turtle-watching program, no matter how broad its objectives: program implementation; monitoring; performance evaluation; and management adjustment. Once the objectives have been articulated and the program designed, implementation cannot proceed solely in providing tours but should provide for the types of reviews and procedures required to ensure that impacts (positive, negative) are documented, measured, and assessed in relation to causal factors; specific findings on impacts and causal factors can be incorporated into a feedback loop for improved management; and adjustments (such as changes in guide-to-tourist ratios, patterns of beach access, or more active tour group management) can be made so as to eliminate negative impacts and/or build on positive aspects. Monitoring. A monitoring program should be designed as integral to the tour operation. It should identify the types of impacts (again, positive and negative) to be measured and the indicators that will be used for measuring them. It is only through monitoring that the operation will be able to determine – and to demonstrate – that it is meeting its objectives and, in doing so, is at least a neutral force or, on clear bases, a positive force for conservation. Visit this site often in order to learn even more about these contemporary issues, how Caribbean communities are addressing them, and how you can help.